Did you know that broccoli is considered a superfood? One doctor even suggested that it’s the only vegetable you need to eat. Unadorned broccoli (or, as we like to say around here, Sideshow Bob flowers) can be a hard sell though, without a nice cheese sauce, or some soy, or Stephanie Izard’s famous roasting process, topped with Rice Krispies. Whisk ingredients together in a bowl until thoroughly combined. Sauce should be thick but not completely smooth. 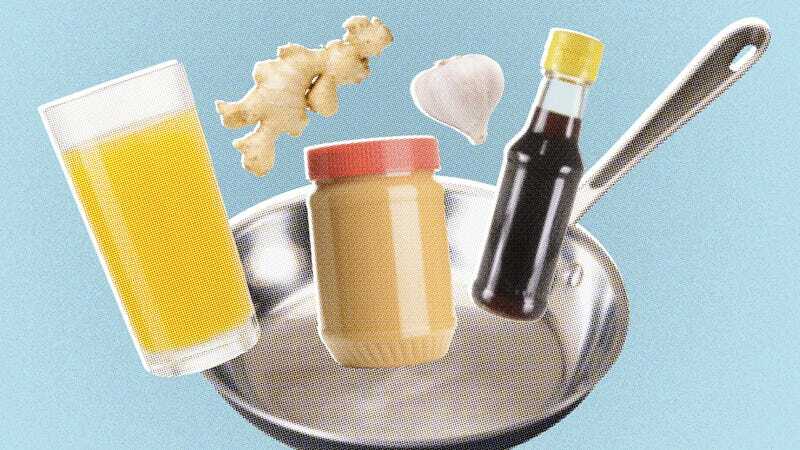 Heat vegetable oil in large fry pan or wok over medium-high heat. Add onion and garlic and sauté for a few minutes until aromatic. Add chicken, cooking for several minutes until cooked through, then add broccoli and continue stir-frying until done (bright green). Finish with sesame oil. Top with warmed-up Peanut Butter Better Sauce and serve on rice.